Have the products you use most delivered automatically. Get 5% Off and Free Shipping over $99 on every future auto delivery order. 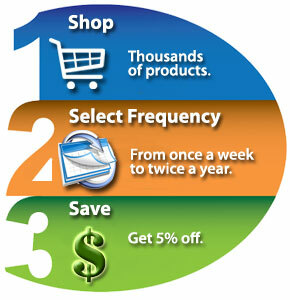 Your products will be automatically sent at the frequency you choose. Modify or cancel your orders anytime. You will only be charged when each order is processed. We will send you an email before and after your order ships. Log in to Manage Your Subscriptions anytime or Contact Us to modify or cancel your ReStocker Auto Delivery order. Please allow up to 24 business hours for cancellation of orders or other changes to be made. Click to read through the FAQs.